You've already learned that the pronoun y is used to mean there (See Y = There (adverbial pronoun)). Here is another usage of y.
Nous pensons à faire nos devoirs. Nous y pensons. We're thinking about doing our homework. We're thinking about it. Il pense à ses vacances. Il y pense. He's thinking of his holidays. He's thinking of it. Elle répond à une lettre. Elle y répond. She's answering a letter. She's answering it. Nous nous intéressons au sport. Nous nous y intéressons. We're interested in sport. We're interested in it. Note that the pronoun y can also replace a group introduced by the preposition à + [thing(s)]/[object(s)]/[location(s)] (but not a person), particularly with verbs that require à. In such cases, you cannot replace the noun alone with a pronoun, you must replace the whole à + [noun] group with y. In the case of people, the group à + [people] will be replaced by an indirect pronoun. See Replacing people with lui, leur = him, her, them (indirect object pronouns) and Me, te, nous, vous = Me, you, us, you (direct and indirect object pronouns). I was surprised to see on one of my tests that "à ma famille" could be replaced by "y," since I thought you could not use "y" as a pronoun for people. 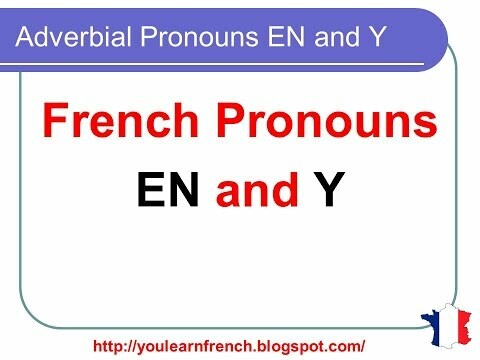 Could you use "y" in place of "à mes amis" as well, for example -- as in "Je pense à mes amis." --> "J'y pense"? Can you please clarify this rule? Thanks! "Good Question. While "family" refers a group of people, in French the fact that it's a group is more important than what that group is comprised of. Y replaces the "group" not "people," if that makes sense. You can't use y when referring to specific people by name, relationship, occupation, etc. I hope that makes sense." I have been told by French people that I cannot apply this rule to the verb commencer à.
Je commence à faire mes devoirs. J'y commence. I am starting to do my homework. I'm starting it. Is it an exception ? Or is it just socially not regularly used ? b) never take a noun object, e.g. arriver. Je n'arrive pas à faire mes devoirs". Je n'y arrive pas. Commencer takes a direct noun object ("je commence mes devoirs") so you can't use "y" to replace an infinitive. Bonjour, i've read this thread of questions a few times and I can't seem to understand why you can't say "J'y commence" since commencer is followed by à. Which i also see is the case on another site that indicates you use à after commencer to mean to begin to. Is it just idiomatic that you can't say J'y commence and is an exception or is this related to a rule? If so i'm not sure I see how that is explained. Perhaps someone can help me? Is it because "y" can only replace a thing or object (which may precede a noun, such as "à faire mes devoirs") and not replace just a verb? Also, the comment by Alan states that commencer takes a direct object which contradicts Cécile's response that indicates it does. Is Alan's statement incorrect? I don't think there's any contradiction between Cécile's reply and mine. Commencer takes à before a verb, but not before a noun. Penser takes à before a verb, and also before a noun. It's this subtle difference that means you can say "j'y pense" but not "j'y commence", even if it's a verb that you're intending to replace. Bonjour Andy ! In this case, it's actually a variant of the expression "il y a" (there is/are) which is used: "il n'y a qu'à + infinitif" meaning "It's enough to + verb" (Literally "there is only/just to + infinitif). In this context, the best alternative with "vous" would actually be: "Vous n'avez qu'à regarder tous les films." (I've now added it to the test answers) I hope that's helpful! On the test the question was "Il pense à sa famille. Elle y pense aussi. If y = à plus thing/object/location (but not a person) and famille is a group of people why is y used? Bonjour M, Good question. While "family" refers a group of people, in French the fact that it's a group is more important than what that group is comprised of. Y replaces the "group" not "people," if that makes sense. You can't use y when referring to specific people by name, relationship, occupation, etc. I hope that makes sense.